Laffengas manages to hit most of the highlights – although he admits he wasn’t able to film every event; he missed Kevin’s plunge into the lake, for instance. 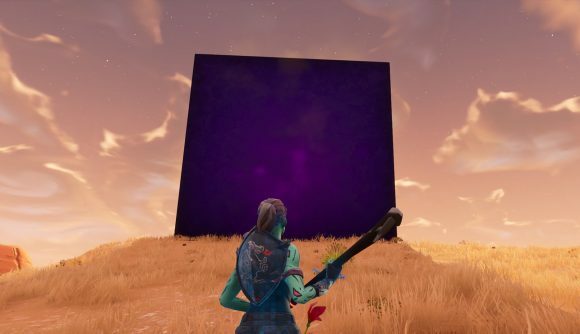 “It’s crazy how nostalgic I felt making this when it’s only been just under a year,” he wrote in a thread on the Fortnite Battle Royale subreddit, where he’d posted his expertly cut video retrospective. “The Story So Far” has a lot of well-chosen shots, but what might be most impressive about the video is how restrained it is – after eight months of recording footage, Laffengas kept the runtime to less than four minutes and was still able to show moments of genuine pathos and beauty. What a ride, right? I’m not a Fortnite player, but I follow along with developments each week, and this even made me feel a little nostalgia for the past year. Fortunately, Fortnite isn’t done changing yet – we’re headed into the winter season now and there are sure to be plenty of surprises in store, particularly for the finale. Meanwhile, you can help Laffengas out by searching his name after clicking the “Support a Creator” button in the Fortnite client.